T415 Forestry Mulcher & Hydra-Stumper | Forestry Machines | Ohio | Rayco Mfg. 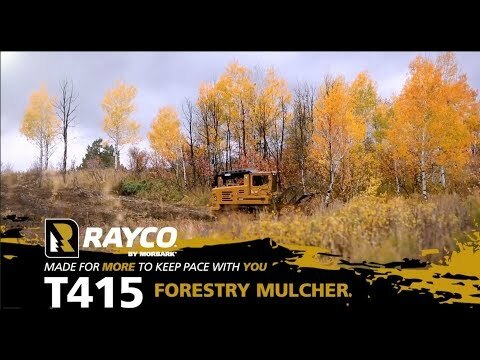 Rayco’s powerful new T415 forestry machine allows customers to change between a Predator forestry mower/mulcher head and a Hydra-Stumper stump cutter attachment for the ultimate in high production versatility. For mowing/mulching applications, the Predator mulcher head has a 91.25” (232cm) cutting width and is powered by a pair of variable displacement drive motors. The Hydra-Stumper head muscles through stumps with its 48” (122cm) diameter x 3” (7.6cm) thick cutter wheel equipped with 56 Monster Tooth™ cutter tools. Powered by a 415hp (310kW) CAT C9.3B Diesel Tier 4 Final engine, the T415 boasts a closed-loop Hydrostatic system to power the mulcher or stump cutter heads, sending 140 gallons per minute (530L/min) to the attachment drive motor(s). The hydraulic output is power-optimized to match the engine’s power curve, keeping the mulcher/stumper RPM constant even under load for a finer mulched product with fewer passes. Rayco’s exclusive elevated cooling design places engine radiators in both the rear of the engine compartment and in the limb riser for maximum cooling in even the harshest environments. Debris screens trap airborne chaff before it can plug radiator fins. Reversing fans clear debris screens on-command, extending service intervals. Other key features include Rayco’s exclusive track tensioning system with monitor, which alerts the operator to over-tension situations; hydraulic tilt cab to access pumps and other components easily; and the 35,000-lb (15,875-kg) hydraulic rear winch. As an option, the T415 is also available with a Denis Cimaf mulching head.